When you get right down to it, New York is really so weird about pizza. There’s a certain pride about it; “the pie” is one of those iconic food symbols of the city. There’s also the egalitarian bent: The slice as common ground. We all stop in for a slice, at some point or another; in a city this diverse, that is something to take pride in. All this pride and emotion leads to a certain protectiveness of pizza’s merits, as if the acknowledgment of the existence of bad pizza, or un-pizza would somehow make these principles less glorious. (Entirely untrue!) So what to make of this? … I was confronted with all these thoughts and more today when, in one of the most humble of all restaurant establishments, the stripmall pizza joint, I found one of the strangest pizzas I’ve ever seen in my life. I discovered the “Fresca Pie” ($30) , “fresh mozzarella, fresh diced tomatoes and fresh basil,” ready and waiting in all its diced tomato glory at Paradiso Restaurant & Pizzeria in Rockville Centre, a small town on Long Island that’s just a short, 40-minute LIRR ride from Penn Station. How would this bruschetta-pizza love-child hold up against the sanctity of the slice? I like to consider myself fairly judicious, but even I don’t think I’d call it pizza. More like: fresh mozzarella and tomato salad, that happens to be on top of a doughy, breadstick-like square. But what does this mean? I’m still not sure, but today turned out to be a much bigger day than I’d imagined. Pizza. Lazzara’s. Dark, cool and cozy even in the middle of the hottest, steamiest afternoon of 2009 (so far). I dined alone, unawkwardly I might add, at a three-stooled bar and did some line revisions and took more pictures of condiments — a handsome condiment bin, that one — while waiting for my half-pie. How was it? Good. 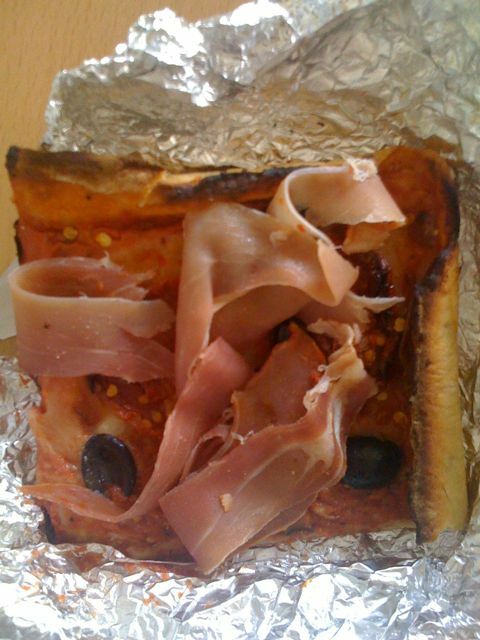 Loved the sauce, the broiled cheese, the generous toppings, the stature of the slices (thin-crusted and square). The only “meh” moment was the end of the crust, which I don’t get along so well with ends of pizza crusts in general, so this wasn’t such a surprise. And while I enjoyed the presentation of three gorgeous, full, slices of proscuitto, I ended up enjoying the slices much more once I’d shredded it a bit and threw on some hot peppers. Alright, I’m out.